Allmusic: A remarkable feature of this work is that each movement establishes its own insistent, dominating rhythm at its outset. The first measure of the opening Allegro, for example, is simply three quarter notes on the tonic note D, a figure that both establishes the work's 3/4 meter and commences the first subject. The flowing, carefree second subject, based on the same rhythmic pattern, derives from a series of rocking chords in both hands. The overall effect is one of cheerful contentment, though the development builds to a considerably dramatic climax. The second movement, Andante is a not-very-slow slow movement in ABA song form. Here, Beethoven creates a serious, lyrical theme in D minor from a series of chords over an insistent left hand in sixteenth notes. The middle section, in the major mode, alternates syncopated chords with descending right-hand triplets, material that makes a plaintive minor-mode return in the coda. The Allegro vivace Scherzo, again in 3/4, rises from a sardonic series of descending single notes, one to a measure and an octave apart, after which the right hand jumps both above and below the left with the theme. The Trio section, reviving the minor mode, is a series of rocking triplet figures. Like the first movement, the Allegro, ma non troppo finale at once establishes a rhythm and commences with the main theme. The movement is in 6/8; the alternation of quarter note and eighth note rhythms provides a syncopated "rambling" feel. 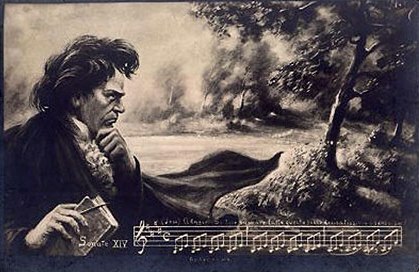 Beethoven finds fresh variants for every repeat of this theme, all the way to the brilliant coda. Allmusic: Playable on a five-octave keyboard, this little sonata lures amateurs and then snares them in unexpected technical complications. Billed as minuet, the first movement takes a measured, deliberate tempo, the simple, pleasant, ruminative theme lifting up from the bass. However, just when the student pianist starts enjoying the somewhat complacent mood of this beginning, the trio storms through with nasty octaves in both hands. This development, which really feels like a strange interruption, seems inexplicable. Returning in a slightly more ornate form, the stately opening utterance leads, once again, to the ill-tempered trio, then appears again, goes through transformations which include some dissonant chords, and ends. The second of the two movements, an Allegretto, is one of Beethoven's typical perpetual-motion rondos. This one has a dark edge to it, veering into the minor and keeping up the flood of sixteenth notes, thus seriously limiting the individuality of the various episodes. Amateurs generally must give up entirely by the time they reach the strenuous coda, in which the two hands race each other to the final bar. Allmusic: The G major Sonata No. 25 contains an opening Presto, an Andante slow movement, and a finale marked Vivace. The first movement also has the qualifying term alla Tedesca, or "in the German style." From the outset, the work arouses a strong and positive impression, as a result of its sharply chiselled rhythmic formulae and a certain direct (if not to say at times abrupt) candor and spontaneity. That feeling of directness and clarity of expression also informs the following movement, a brief but eloquent Andante in 9/8 meter and simple ternary form. This not only re-affirms Viennese tastes, both in terms of the directness already referred to, but also in the pronounced feeling of "naturalness," at times approaching pastoral straightforwardness that is an unmistakable characteristic here. Simplicity and directness are also crucial in the brief and witty finale, a fully formed Vivace rondo, lasting fractionally under two minutes. This sonata is sometimes given the nickname "The Cuckoo," because of the distinctive pattern of falling intervals and repeated note groupings that permeate the score at various points, never more obviously than during the final movement.